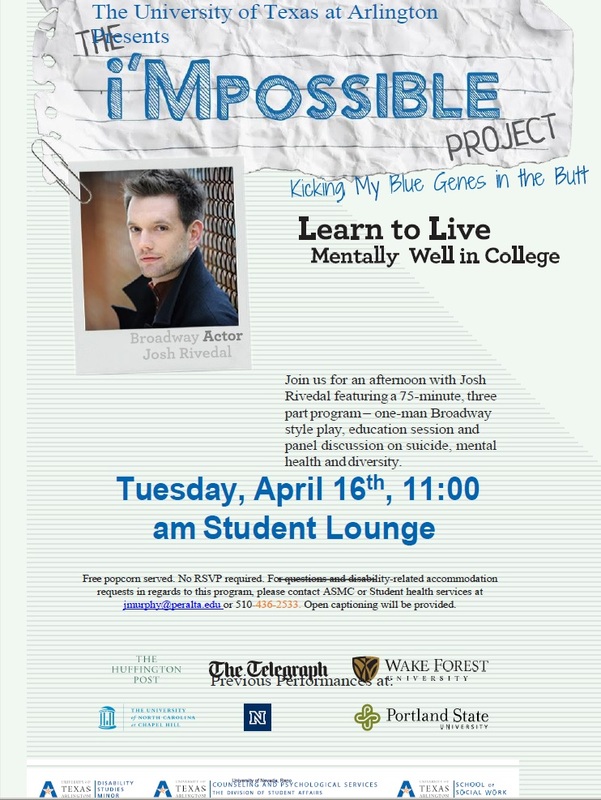 Join us for an afternoon with Josh Rivedal featuring a 75-minute, three part program – one-man Broadway style play, education session and panel discussion on suicide, mental health and diversity. Free popcorn served. No RSVP required. For questions and disability-related accommodation requests in regards to this program, please contact ASMC or Student health services at jmurphy@peralta.edu or 510-436-2533. Open captioning will be provided. Check It Out: ASMC President Ya’Mese Johnson on KQED Radio! Merritt College’s very own ASMC President, Ya’Mese Johnson, was on KQED’s The California Report! President Johnson spoke briefly about housing and hunger relating to academic success in the California Community College System! She has started the conversation and hopefully we can band together and find solutions together as the hard-working and dedicated Merritt College that we are!! Brittany Jones was a homeless college student at Laney College in Oakland until she got housing assistance to help her rent an apartment. Photo from November 2016. 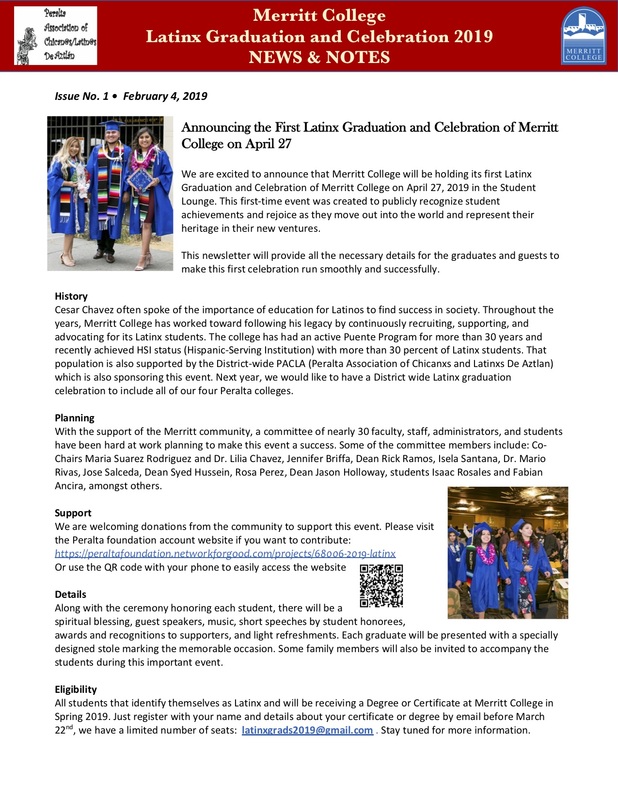 Want to be Part of the First Latinx Graduation at Merritt College? See Below for More Details and Register Now! Merritt College is holding its first Latinx Graduation and Celebration this year on Saturday, April 27, at 3 p.m., in the Student Lounge, to publicly recognize the achievements of our Latinx graduates and rejoice as they move out into the world and represent their heritage in their new ventures! If you identify as Latinx and are receiving a degree or certificate and would like to participate, please register now to be part of this new tradition at Merritt! See the newsletter below (or click HERE) to find out all the details. Once you are on the list, you will be receiving updated information. To register, write to latinxgrads2019@gmail.com. The deadline is March 29, but there are only a limited number of seats available, so it’s best to register now to assure a space! Also please see the official letter below (or click HERE) asking for donations from the community to help with this effort. 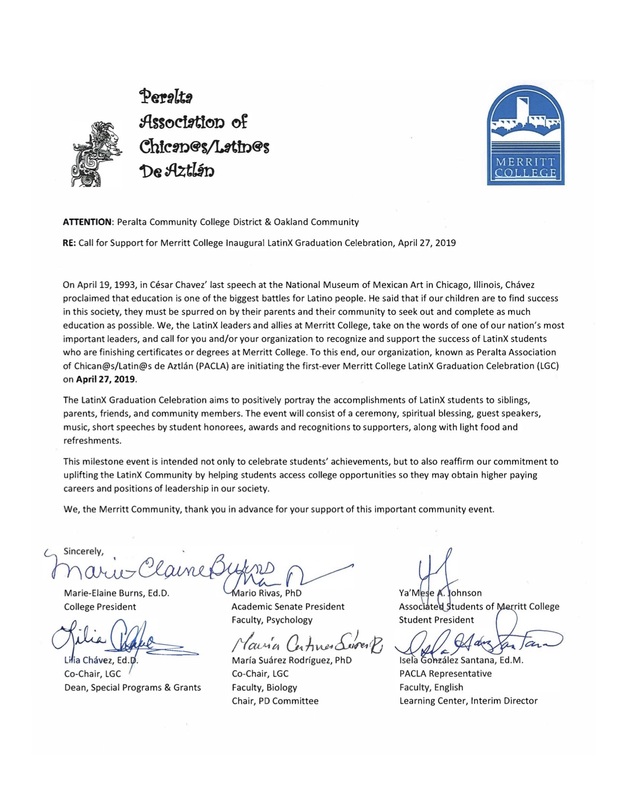 Thanks to the Committee of the Latinx Graduation and Celebration 2019 for all their planning and hard work to make this event a reality! Tony Hampton grew up taking things apart and putting them back together. He started with doorknobs and toasters, graduated to stereo systems and auto wiring, and, in the late 1970s in Southern California, discovered a new phenomenon called computers which he thought were interesting but never would be useful. Along with his computer hobby, Tony spent a couple of decades trying to decide what he wanted to do as a career. He started earned a living doing factory work, held a security job, and then was trained to do high-voltage electric work which he did for 10 years. In between he went into the Marine Corps Reserve where he held several jobs and worked his way up to becoming a sergeant. At one time he thought he wanted to be a police officer, but then decided against it. In 1997 Tony was a student assistant working with now-retired anthropology instructor Barbara Joans, and he wanted to upgrade her computer with more memory and a better version of WordPerfect. When he went to the CIS office to see if they could help, they directed him elsewhere. When Tony was interviewed by Chancellor Jowel Laguerre on C-Direct TV as one of the District’s outstanding employees in 2017, emails began pouring in with praise from the Merritt community that he can carry with him on his retirement and remember his Merritt family as they will always remember him. (See samples below). See what’s new at Merritt in the latest issue of The Merritt Connection! The college celebrated the Lunar New Year (Year of the Pig), students from the Inter-Tribal Student Union initiated a successsful official Indigenous Peoples Day for the City of Oakland, a Native American ecology class is beginning at Merritt for the first time on March 1; real estate students graduated from a special program with jobs available at the end of it; and much more! Click HERE or on image to open! Darby Price has taught over three dozen courses during his teaching career, and most have covered some aspect of ethnic or environmental studies. 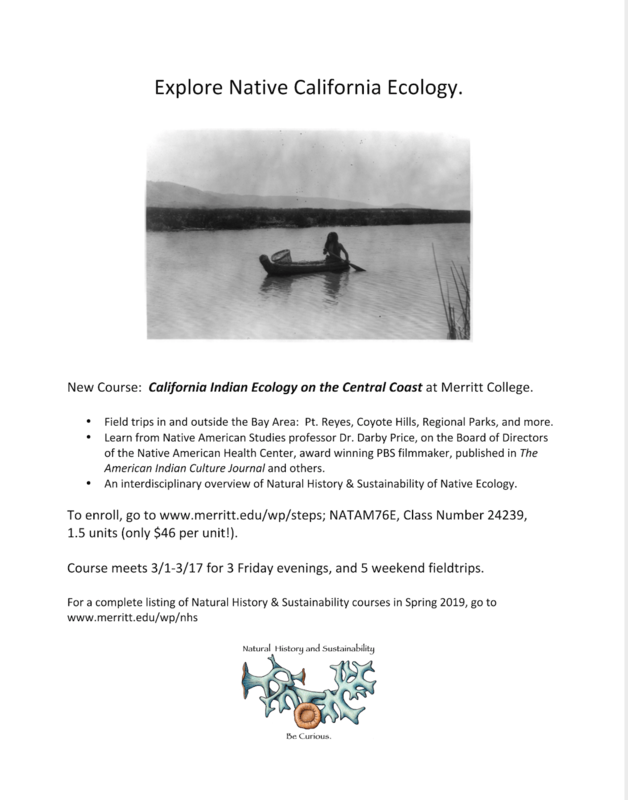 So he is especially excited to offer a new course that combines both at Merritt: “California Indian Ecology of the Central Coast” (Native American Studies 76E, starting March 1.
ago on the California coast to the present. Students will spend most of the course exploring the Bay Area’s incredible biodiversity through field trips to Point Reyes Miwok Cultural site, Coyote Hills Ohlone site, an Oakland shellmound site, East Bay Regional Park’s Native California botanic garden, and the Native American Health Center (where Darby is a member of the board of directors). which brings together environmental-related classes from a variety of disciplines that offer the knowledge, training, and skills to find a career and help tackle the challenges of the 21st century. Other courses still available for the Spring: Feb. 4: Bay Area Field Studies (GEOL 21, #23387); Feb. 19: Herpetology (BIOL 60C: #24194); March 7: Wisconsin’s Ice Age Trail (BIOL 62W, #24207; March 13: Islands of California (BIOL 62S, #23388). Classes started January 22, but there’s still time to enroll up to Feb. 1 (online Feb. 4) Check below for all the links you’ll need to make it happen now: Full class schedule, course listings only, steps to apply and enroll, college catalog, Spring 2019 academic calendar. Just do it! Dr. David M. Johnson has been named Vice President of Instruction at Merritt College as of January 2019. The Merritt community is invited to a welcome reception for Dr. Johnson which will be announced shortly. Dr. Johnson comes to Merritt from Las Positas College in Livermore, CA, where he served as Interim Vice President of Academic Services. In that position at Las Positas, Dr. Johnson was responsible for the enrollment management, academic compliance, budget supervision, and overall instructional support for 120 degree, transfer, and certificate programs. He also worked closely with the faculty, staff, and administration to ensure that the institution me accreditation standards were aligned with state initiatives. Prior to assuming this role, Dr. Johnson spent more than seven years as an administrator at Cañada College in Redwood City. As the Dean of Humanities and Social Sciences, he provided responsive and transparent leadership to foster a culture of partnership and open communication with faculty, staff, and students. He also directed educational outreach through the ESL Community Based English Tutoring program, the Adult-Education College and Career Educational Leadership (ACCEL) Coalition, and dual-enrollment partnerships with local school districts. While serving as the Interim Vice President of Instruction, he took the lead in identifying and supporting professional development opportunities for faculty and staff to stimulate and reinforce excellence in pedagogy and student achievement. He also worked closely with the district office, faculty, and staff to plan and implement capital projects and structural upgrades. Before moving into administration Dr. Johnson spent 15 years in the classroom, teaching at such institutions as the University of Washington, the University of California, Berkeley, and California State University, East Bay. But it was the experience of teaching at Berkeley City College—first as a part-time faculty member and then as a tenure-track instructor in history and African American Studies—that continues to inform his perspectives and priorities as an educator. Raised in Oakland, CA and a product of the Oakland Unified School District, Dr. Johnson holds a bachelor’s degree in Mass Communication from U.C. Berkeley, a master’s degree in Communication from the University of Washington, and a doctorate in History from U.C. Berkeley.